rescue in need cause her grampie left her green stuff when he went to the rainbow bridge. 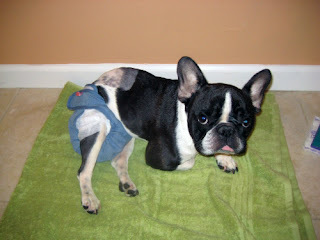 is a French Bulldog in need of a special home. "Gui came to FBRN after he fell off a bed while playing and injured his spine, going down in the back. His former owner couldn’t afford the surgery to make him well, so he made the loving decision to turn him over to us for a second chance. Gui has recovered somewhat, but needs a forever home that will protect his back from further injury." Awww - Gui is so precious! I hope he finds a special family, who can give him his forever home! I hope Gui finds a loving home...sweet boy. Where is he located? Awwww, Gui! You are such a sweet-looking little boy. I'm very much sorry that happened to you but I know your Most Perfect Home That Ever Was is out there waiting for you! Thank for pawticipating, Benny & Lily! That is so sad....he looks like the sweetest guy....hope all goes well for him....and he finds the best loving forever home that he deserves very soon. Guji is adorable! I hope that he finds a forever home soon that can care for him! We'll bet your post helps Gui find his perfect forever home. What a cutie! OMD, Gui is so sweet and special. I sure hope someone adds him to their pack and gives him a good life. Wow, what a cutie. We love his little skunk-face!! Good luck to sweet Gui!! 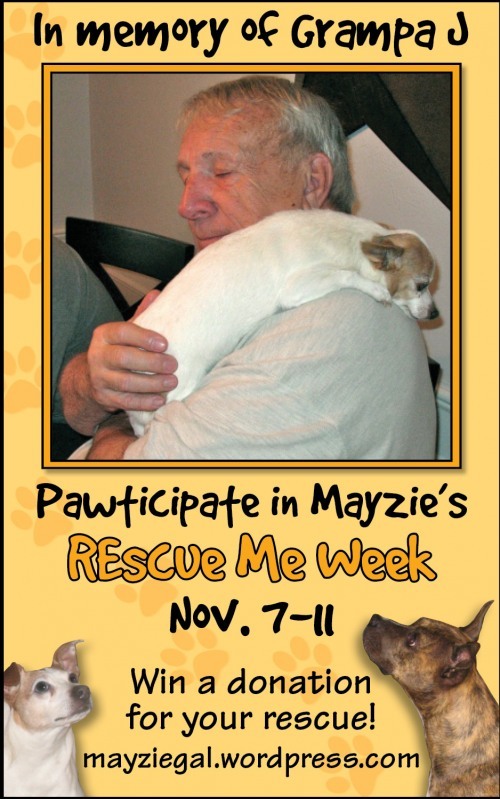 Gui is sooo cute and how nice of Mayzie and her mom to help pets in need! Poor little Gui... his face is so sweet! I hope somebody nice will give him a wonderful new home. Mayzie you are a hero! Poor Gui..we hope he finds someone very soon. He looks like such a sweetie. What a precious little FB! We hope Gui finds a loving home. We are thankful Gui's former family made a most difficult decision in Gui's best interests. Sending love. It's nice of you to spotlight the little guy. Awwwwww the poor guy. 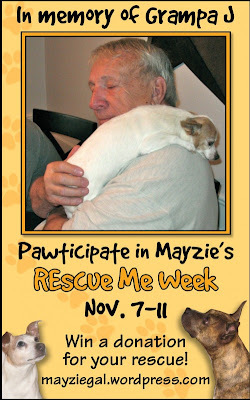 I really hope that Mayzie's big thingy, to honor her grandpa, will help 87,000 fur folks to find their Furever homes. Superb post. He really needs a home. That was a pswsome post! I sure hope that Gui finds the bestest loving home like ever! Gui is such a handsome boy! We hope he gets that loving forever home soon! That sweet little face could melt the hardest heart. I hope he goes to the perfect home soon! Oh poor little Gui. I hope he finds a good home. Gui is such a cutie patootie. Mom went SQUEE when her saw his foto. We sure hopes and prays dat he finds his special furever home soon. We are keeping our paws crossed for sweet little Gui to find a forever home too. He just looks so sweet. A special dog needs a special home indeed. I hope that Gui finds a wonderful home. 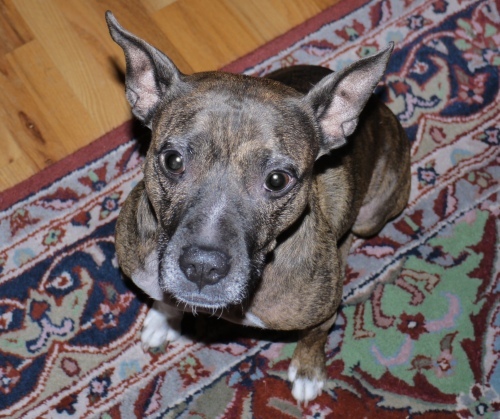 We had a dog who had a spinal cord problem that led to her being paralyzed for the last year of her life. She still had tons of fun rolling around in her doggy wheelchair! I hope that Gui can find a vet to help or else get a fun chair! Poor thing! I hope he finds his furever home soon! I was touched about Gui's life. I would tell my friend about this one.